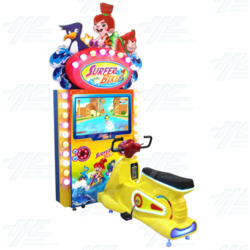 The Surfer Bike Arcade Machine is a kiddy bike game, redemption, which is suitable for your kid's playground. The Surfer Bike Arcade Machine is single or 2 player surfer bike racing game with kid friendly game design with colourful graphic. It is a very simple, straight forward, and fun game. So, any family should have one to give the most enjoyable childhood memory to their children. This Surfer Bike comes with a number of fun features to keep player entertained and coming back for more chances to win! The Surfer Bike Arcade Machine is single or 2 player surfer bike racing game with kid friendly game design with colourful graphic. It is a very simple, straight forward, and fun game. So, any family should have one to give the most enjoyable childhood memory to their children. This Surfer Bike comes with a number of fun features to keep player entertained and coming back for more chances to win!